After a day to recover from jet lag, we left Birmingham early Thursday morning and made our way down the M-5 to Cardiff. We had a low battery on the ‘Sat-Nav’ (U.K. for GPS) so we stuck close to the motorways instead of our original plan to cut through the South-East Welsh countryside via Abergavenny and my family’s town of Bryn Mawr. This turned out to be a good call since we tried to jump off the M4 after crossing the Severn bridge into South Wales to find Bryn Mawr blindly, and proceeded to get turned around and incredibly lost in the heavily-wooded valleys, forcing us to turn back and scramble to motorway safety. After that hour long schooling of left-side, roundabout-laden misdirection, we finally got back to the M4 and into Cardiff with little traffic, and navigated our way through the city centre, around Cardiff Castle, and into the Pontcanna District where we checked into the Beauford Guest House on Cathedral Road. 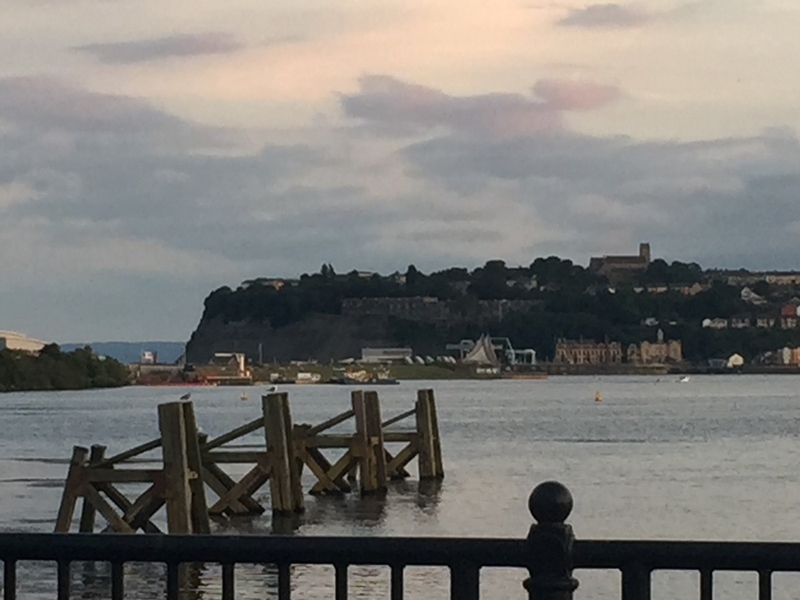 The B&B was in a perfect location with immediate access up the road to the cricket fields and park (formerly the Cardiff Castle grounds), and equidistant to the city centre. Having driven all morning, we were pretty hungry so we lunched at the The New Conway Gastropub - also up the street from the B&B. We turned out to be fairly early for the pub, which had just opened its kitchen for the day so the place was still empty. But the food was tasty regardless. Carrie had a light salmon salad, and I had some Welsh sausages glazed in mustard and a burger. All the meals were served on wood boards (like we do at Snowdonia), and the food was fresh and satisfying. We then strolled all the way back down Cathedral Road towards city centre. The great thing about Cardiff is that almost everything is a stone’s throw from each other. The castle entrance marks the top of the centre of town and from there you can drop down into the main square and surrounding markets. I was immediately surprised how many more malls and markets had popped up since I had been here with my brother in 1998 (Carrie and I had tried to visit Cardiff in 2010, but couldn’t find a room due to the Ryder Cup tournament so we turned around and went back to England). The city looked much fresher and cleaner than I had remembered in '98. Back then Cardiff was occupied mainly by chains and fast food joints, with Brain’s Beer having a monopoly on the pubs. Now there is much greater variety and even Brain’s itself is competing with the growing craft beer market by producing a line of Brain’s craft beer. We spent the rest of the afternoon orienting ourselves to the city, browsing the shops and open markets and, most importantly, we purchased a working Sat-Nav for the car. At 15:00, we stopped into The Potted Pig restaurant to meet the manager, Georgina and the chef, Gwyn. The restaurant was between lunch and dinner service so we had a nice relaxed chat over a cup of coffee about the hardships of getting small, private restaurants to work in neighborhoods that were considered “unfriendly” to quality food and drink. Like Snowdonia in Astoria, Gwyn and Georgina jumped on a good rental deal in the very centre of Cardiff where, as I mentioned earlier, there was nothing but chain restaurants and Brain’s-owned, run-down pubs. The Potted Pig is less than 100 yards from the castle gate in a building that was formerly a Lloyds bank. 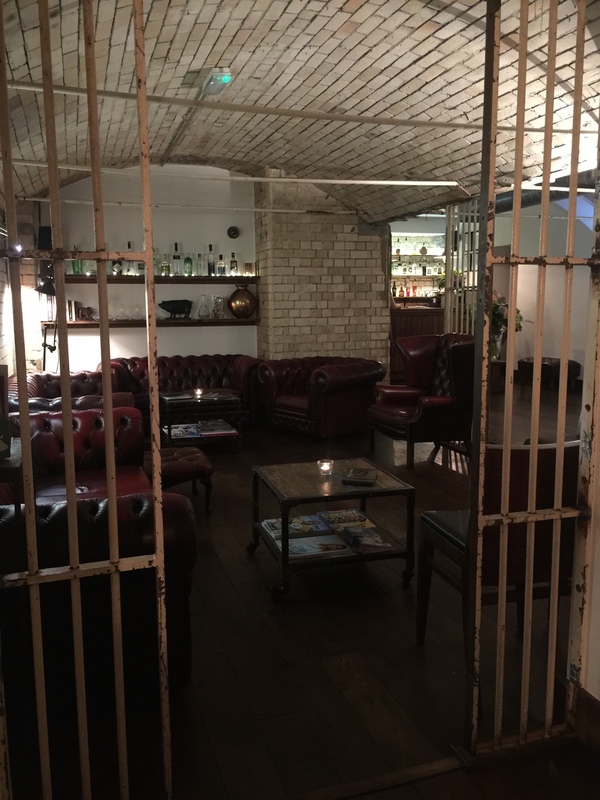 They took over the basement that used to be the bank’s vault, and they’ve left some of the barred gates to keep that underground vault ambience–kind of a cool, safety bunker ambience. Georgina and Gwyn clearly put lots of love (and money!) into turning the vaults into a functional kitchen, the result looked fantastic. We were so impressed by the owners’ passion and hospitality that we returned that evening to eat. Carrie ordered a cider and I tried to order a locally-brewed beer from a garage-brewer called Pipes Brewery, but they were out of Pipes. Instead, I ordered a Cardiff-made craft beer called “House Lager” which was super hoppy for a lager and very crisp. Carrie ordered a pigeon starter on a bed of blood pudding. This began Carrie’s new-found passionate search for blood pudding wherever we would go next. The meat of the pigeon was rare and had a wonderful red meat flavor that married perfectly with the savory pudding. I ordered the namesake, the potted pig, which was a type of pork rillettes -- a shredded but incredibly moist pork spread that came with pickled vegetables and house-made sourdough bread. It was simple and awesome. For the mains, Carrie ordered the lamb and I ordered a roasted ham hock that I had spotted at a table next to me. 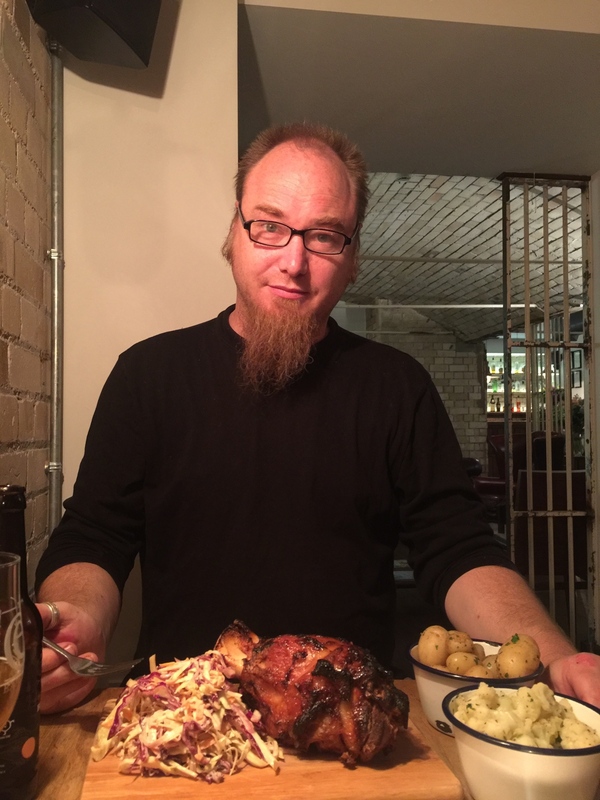 Her lamb was perfectly cooked and awesome, but the sheer size of my ham hock stole the show. It challenged the size of our portions at Snowdonia -- something we pride ourselves on. Gwyn had told me that The Potted Pig shied away from the more expensive cuts such as fillets to give a heartier and more affordable fare, but in no way did this lower the quality of the meal. It was phenomenal. 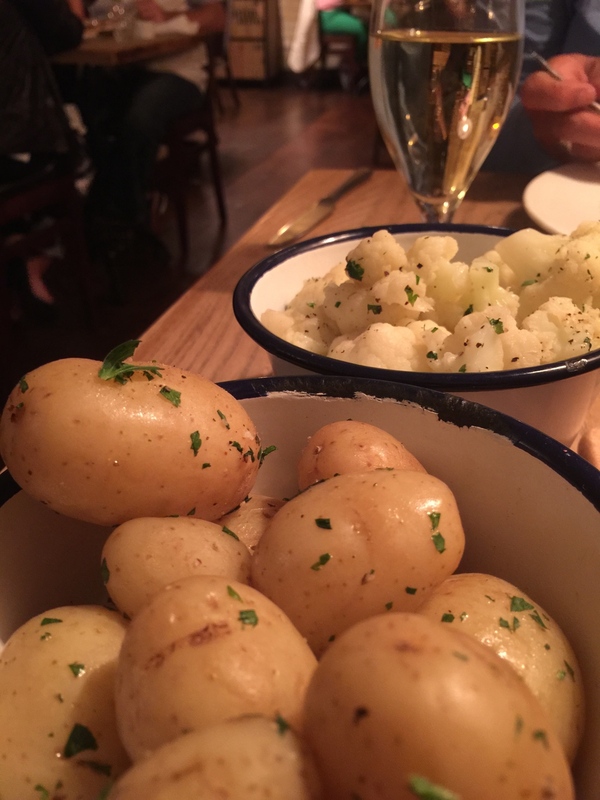 Each served with a bowl of steamed potatoes and cauliflower, the meal was difficult to polish off even for a 6’ 2” Welsh transplant such as myself! We couldn’t be happier with our first dinner, and the meals to come would have to work hard to beat such a great first impression of Cardiff cuisine. After such an experience, we were in no rush to get home so one of the waitstaff suggested a cool craft beer house around the corner from the restaurant called the Urban Tap House. The place had a young, late-night vibe, but was quite welcoming. 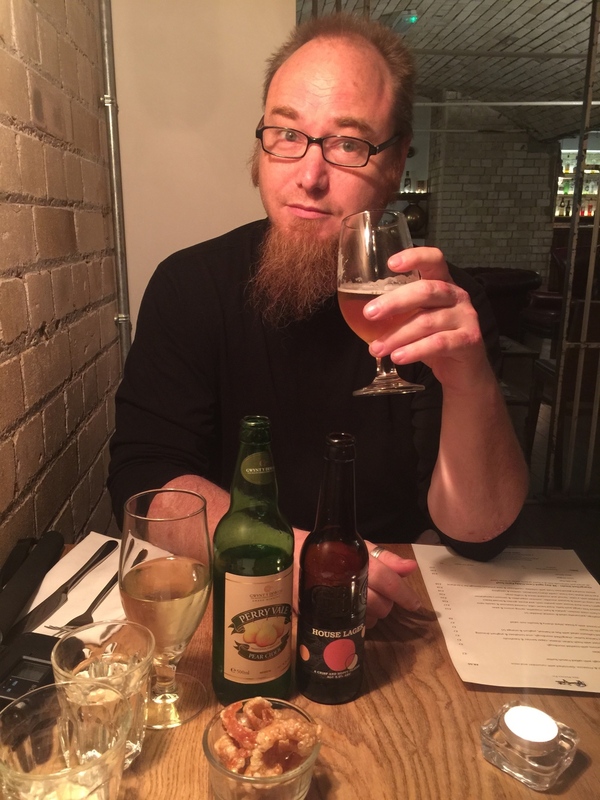 We had a few drafts of Rebel IPAs (another Cardiff-made brew), and hung out chatting with an Australian guy and Dutch girl who were bouncing around the UK. I went outside for a smoke and struck up a conversation with the bouncer and manager, where I found out a little more about nightlife in Cardiff. Cardiff is a university town so it has a lot of late-night offerings. They told me the Tap House was open until 2am while others could stay open even later. It was refreshing to discover that other New Yorkers would be able to find some late night hangouts here in Cardiff. Unlike New York, however, we finished our last draft and bought two more bottles of Rebel to bring back to the Guest House where we drank them and immediately passed out after a twenty-hour day of touring. As a result of our jet-lag-produced morning schedule, we were up by 8:00 am. We went downstairs to meet one of the charming Welsh owners of the B&B that immediately announced to the whole room that we were from New York. Luckily, the room was filled with itinerary-bound Germans so the embarrassment factor was minimal. We had a lovely full breakfast, and went out for a stroll through the Pontcanna to kill time until we met Sian Roberts from Loving Welsh Food at 11:00. We walked through the park a bit, discovering a prettier shortcut to the city centre that cut past the pub, Y Mochyn Du, over the River Taff via footbridge and into Bute Park. We then backtracked up through the cricket grounds and down Pontcanna, scouting possible shop visits. We made it back to meet Sian, who swooped in to pick us up in her black mini. Our first stop was past City Hall and the National Museum of Wales, at a place called Park House, where Sian, Carrie and I would get clear as to our day’s itinerary over coffee. The Park was formerly a private club that had been taken over and become a fine dining establishment. We were met by the proprietor, who, at first, seemed to be put back by being visited by a New York Bar. He warmed up to us quickly, however, after we put on our business hats and talked about the difficulties of maintaining quality food in general in a city. His concern was that most Welsh produce was being shipped off immediately to London for first pick. We shared that the same is true for us in Astoria as we are always in the shadow of Manhattan, but that you can work directly with local farms and brewers if you put the effort in. He admitted that he had already made local connections, and soon we were on the same page. 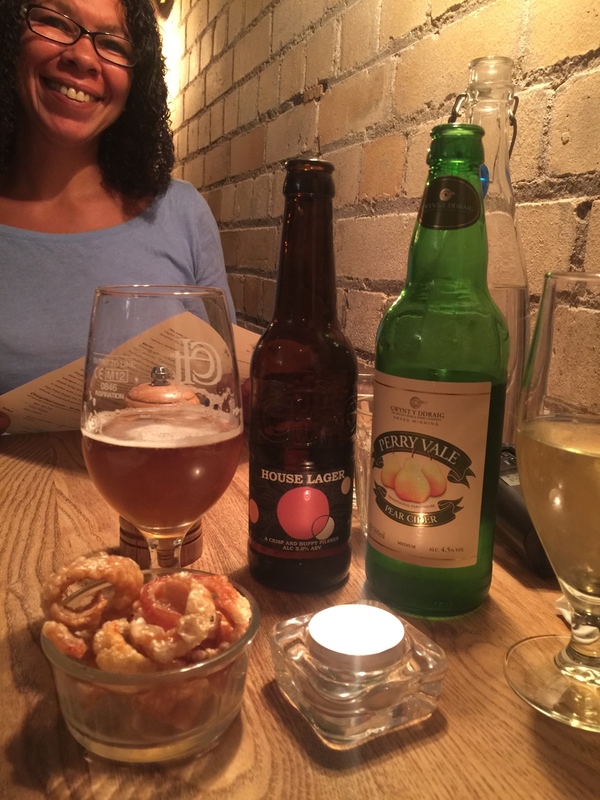 We shared an awesome cider from a local brewery called Coles (searched all over in stores and couldn’t find a bottle to take home!) and a great beer from the Gower Brewery in Swansea called “Gower Power.” Even at 11:30 in the morning I had to finish that beer! It was that good. Feel the power. Gower Power. We moved through the market and picked up some faggots in gravy, which in New York would be a completely different thing and probably take place much later at night. Faggots in Wales are breaded cakes that contain liver and hearts, but are extremely tasty (especially as I am not a fan of liver most times). These went down easy as comfort food should. The next stop was a Cardiff local pub called The Old Cottage where Sian taught me how to order a “pint of dark” like a real Welshman, and I drank it like one too. We then set out back through the castle grounds to have a cup of coffee. Once caffeinated we got back in the mini, picked up Sian’s mom and drove back to Pontcanna where she dropped us off at a deli run by an Anglesey native. We tasted some cheeses and scanned her deli for North Wales products to seek out when we got there. 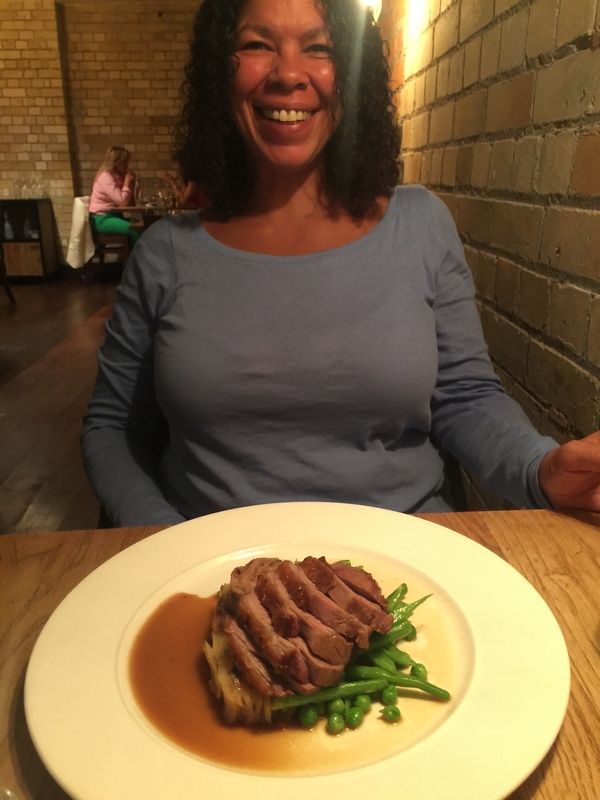 We thanked Sian profusely, knowing we had met a new and very good friend. We walked around the Pontcanna, and discovered the location of Pipes Brewery in a dead-end close. Unfortunately it was closed (natch) so I still wasn’t able to try it. Instead, we walked a while towards a pub owned by Gwyn from The Potted Pig. 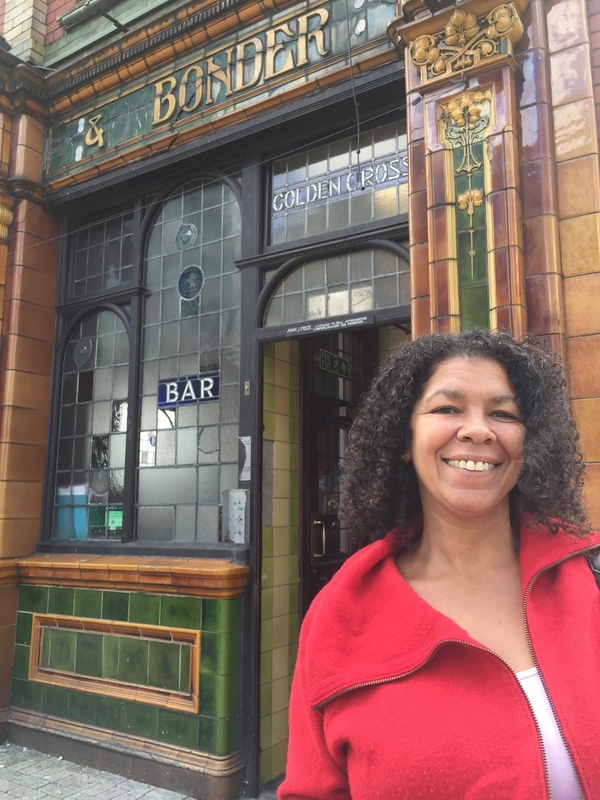 This was a real straight-up Welsh pub -- and they had Pipes on tap! And it was worth it! It reminded me of Singlecut back home with a fresher-than-fresh hoppiness. So good I had two before we walked back to the B&B. We had ourselves a quick nap and then set out to find Chapel 1899. We walked all the way through downtown and found it near the train station. The place seemed lovely and posh, but wasn’t our scene. It was like a hold over from The Long Good Friday filled with Bob Hoskins-like characters and drink offerings. So we left there and hopped a train to Cardiff Bay to get a look at the Millennium Centre. Being Torchwood fans, the big opera hall did not disappoint as it stands prominently as an awesome architectural accomplishment in the middle of the bricked pier. We took a couple of pics and then strolled down to find the old Norwegian church that was now a restaurant. (We found it, but it was closed.) We continued along the bay to find the Doctor Who Experience, being major Whovians ourselves, but that was closed as well. We doubled back, but the rest of the bay was dotted with chain and themed restaurants, none of which were very appealing. We were running out of steam and it was getting late so we hopped in a cab and went back to The Potted Pig before it closed up for another great meal. We intended to hit The Urban Tap House again, but fatigue got the best of us, and with a busy driving day ahead, we went back to the room and collapsed. Up at 7:00 am (unbelievable since we're normally getting out of work around then) and another great big Welsh breakfast. Jumped into the car and headed north towards Pontypridd. We unfortunately skipped past Castel Coch -- after our first miscalculation of time and space in the valleys, we didn’t want to be late for our appointment in Penderyn. We pulled off in Pontypridd to take a quick look at the market. It was similar to the Cardiff market but had a bit more of a local-vendor feel. There were mobile butcher vans and local clothing markets so after an hour, we felt we had soaked enough in. We headed straight up to Penderyn, which was on the south end of the Brecon Beacons National Park. When we pulled in, we were stunned to find a handsome wood-planked distillery with the familiar Penderyn logo stamped upon it. And of course, we were early so Sian Whitlock, Penderyn’s super-friendly and dedicated market head, had yet to arrive. 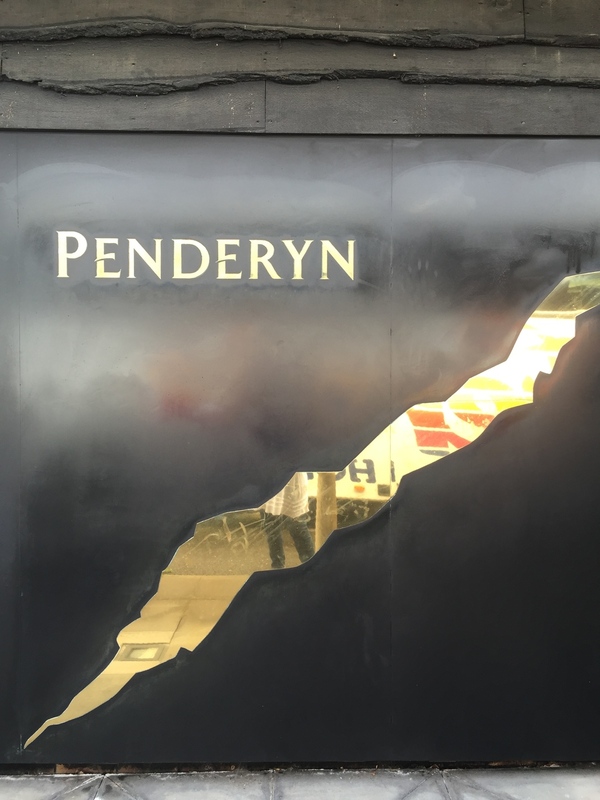 We took an earlier tour around the distillery, and discovered how Penderyn Distillery became the first Welsh Whiskey in over a hundred years. Ironically, they bought their barrels from Buffalo Trace in the states so we shared some familiar ground there being bourbon aficionados. The distillery aged the whiskey in pre-seasoned bourbon barrels for four years and then moved them to either sherry, oak or peated casks to finish off the color and flavour. 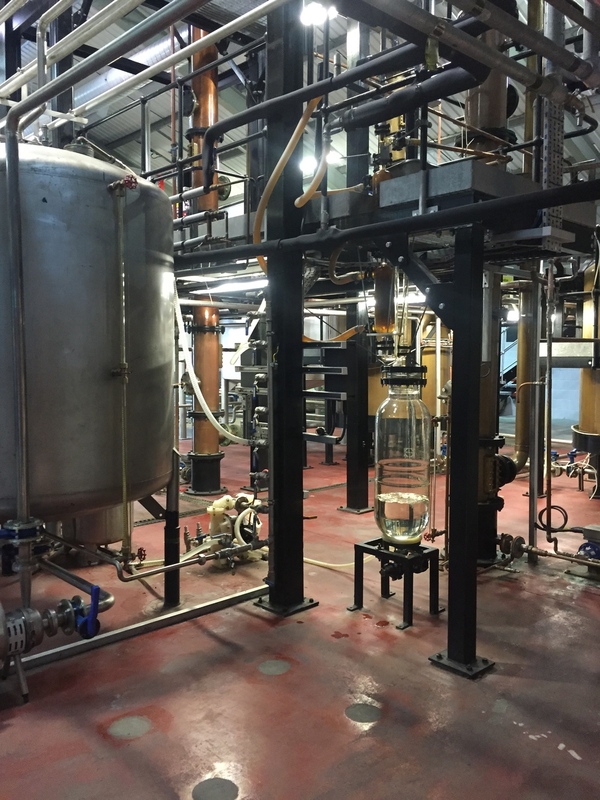 This amazing process allows them to get the same product as most single-malt scotches without being restricted to the age process of the barrels. We finished off in the tasting room where Carrie was able to partake, but I had to hold off because I was the designated driver. It was there that we met up with Sian Whitlock. Sian, Carrie, and I shared a great talk over coffee where we discovered we had similar interests in building up Penderyn’s presence in New York. New York City is filled with whiskey lovers and so it would make sense to build up awareness of Penderyn in Snowdonia! We agreed that while the Penderyn folks were in New York in September, we would have a private tasting session at Snowdonia for their crew and the locals! AWESOME! 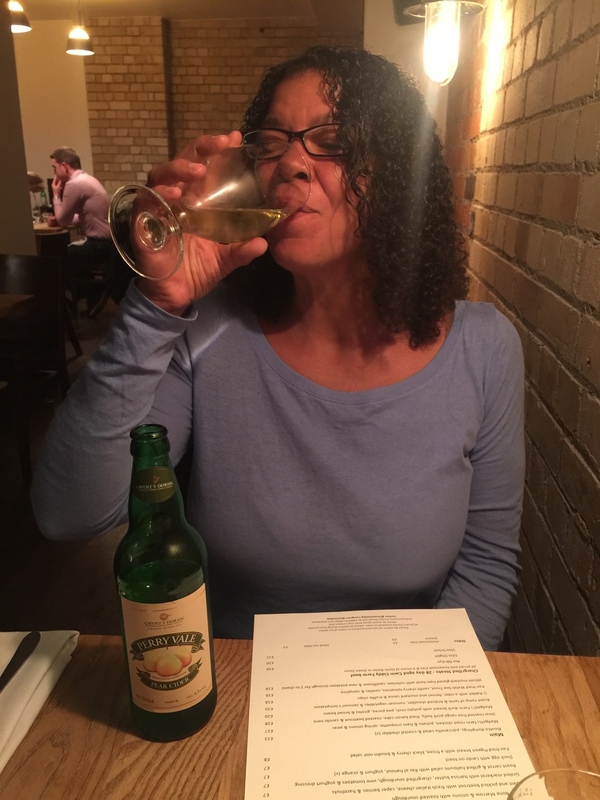 And, of course, we left with five bottles of Penderyn –- one of each type -- and then hopped back in the car to head on to our next stop: the gastropub, Felin Fach Griffin. The drive through Brecon Beacons was gorgeous. There were tons of sheep to keep Carrie snapping pictures, and the landscape was just magical. Buried deep inside this wooded paradise is a rural inn and eatery run by Julie Bell (and her many dogs!). Julie was a hyper-kinetic and super sweet Irish transplant that so clearly was proud of her little getaway. Designed from top to bottom to be a total escape from modern technology (nothing but books, no T.V. 's and no internet), Felin Fach Griffin was far from being a stop-over barn. We had arrived too late for the standard lunch menu, but the kitchen provided a ploughman’s plate that was to die for: Fresh mature cheese, fresh bread, cornichons, curried cauliflower assorted raw vegetables -– so filling, so good. We sucked down a pint of local bitter, and then Julie toured us around the yards and rooms. Much food came from their own garden, and Julie’s pride was completely justified having created such a classy place in the arguable middle-of-nowhere. “People ask me why I moved out here where there’s nothing to do,” said Julie, ”but there’s plenty going on out here, you just need to want to find it and it's right there!” We left Felin Fach Griffin with full bellies and a wide-eyed respect for the idea that such a great restaurant and inn could exist in such a quiet and removed area. Well done Julie! We drove across the top of Brecon Beacons to a quaint little stop-over known as Hay-on-Wye. This little town’s claim to fame is that it is filled with bookstores. Most of the local buildings like the chapel and town hall have been modified into rare book shops. The town is worth a little walk through, and if you’re into finding rare little out-of-print books this is where you'll find them. From there we blasted back through Brecon Beacons south towards my grandfather’s village of Bryn Mawr, to take a quick snapshot of my great-grandmother’s house. 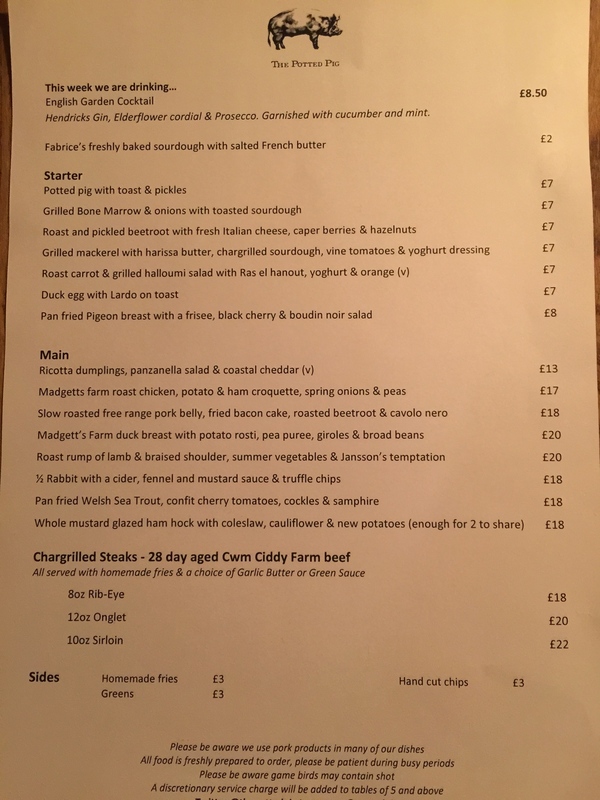 From there, we went on to Abergavenny in hopes of grabbing a table at Steven Terry’s The Hardwick, a gastropub that is supposed to be the current gastropub of gastropubs. Popularity seemed to prove the truth of that claim, as we couldn’t get a table! We moved on to pick up our friend Adrian in Stourbridge, where we would leave once again and tear past Cardiff out towards West Wales.